Easy to install and smooth operation make these ideal for my studio. The white is a nice warm white, clean and airy. I ordered a pair of these, they arrived ahead of schedule and very well packaged. The installation was as simple as mounting three brackets to the top of the window casing, then clipping the head rail into place. The operation is simple and well-balanced - you can raise the shade with one finger. I paid over three times as much for top-down bottom-up cellular shades for another room a few years ago. I'd recommend these to any friends or family members. Note, they filter light but do not block very much light. For my purposes, this was exactly what I wanted - I lower the tops for privacy. A great deal for the money. My dog approves too. 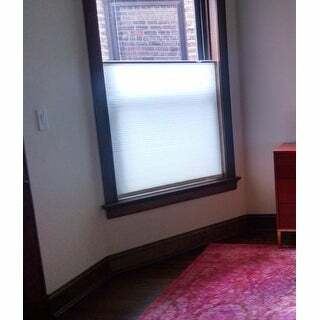 I needed to allow light in but also get privacy since we're in a city apartment where one of our windows looks directly into a neighbor's unit next door. This was an affordable fix, neutral ivory-like color and the room is so much brighter than with curtains.